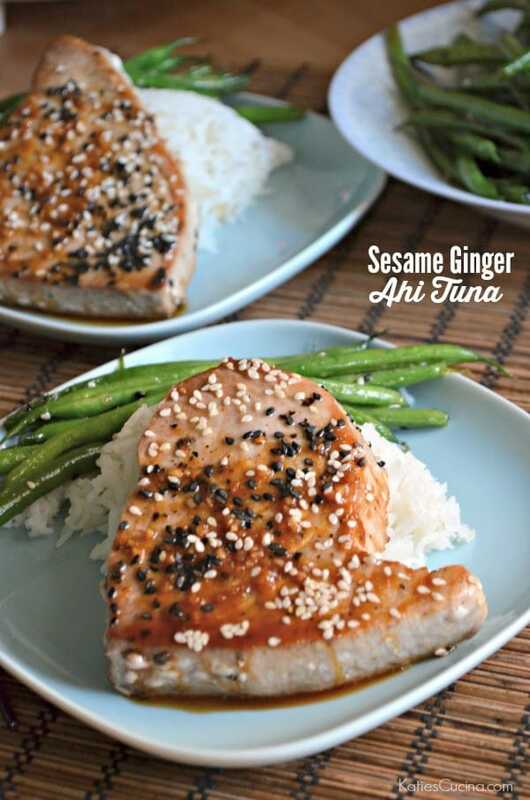 Make these restaurant quality Sesame Ginger Ahi Tuna steaks at home and in minutes! I know a lot of people are intimidated by making fish at home. I’m constantly answering questions on how to cook fish perfectly. Sadly, I don’t have a great answer for it because I just know… and I haven’t figured out exactly how to explain it without showing. But one thing I have perfected is cooking ahi tuna. We love ordering ahi tuna steaks when we go out to eat. But since we rarely go out to eat any more I’ve decided to start cooking it at home. 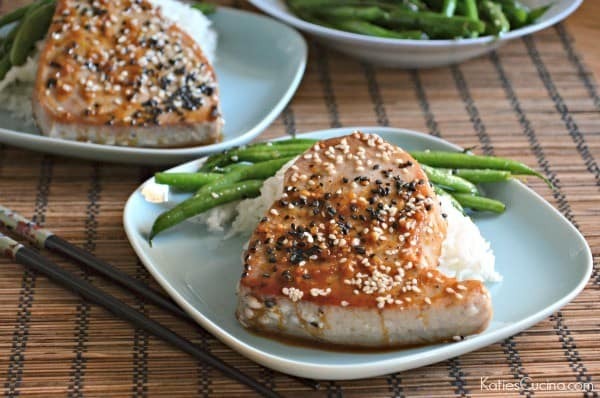 After a few attempts I’ve finally perfected these Sesame Ginger Ahi Tuna Steaks. The key is to make the sauce ahead of time and then season the tuna steaks well with salt and pepper. You will only cook these for just a few minutes so having the sauce prepared before you cook the steaks is key. Then during the last minute of cooking you’ll pour just a little bit of the sauce on top of the steaks. Let it cook into the steaks and then pour the additional sauce once the steaks are plated. 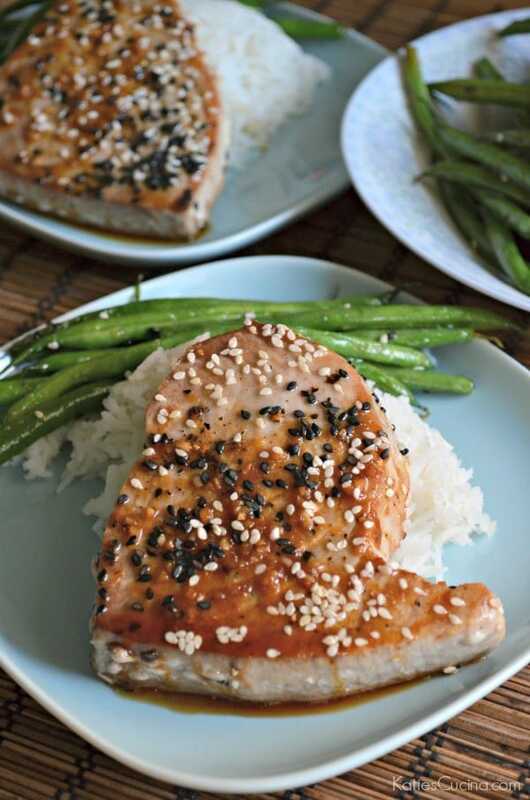 Sprinkle with both black and white sesame seeds and dinner is served. This has been one of my quickest meals to get on the table to date. As long as my husband is home and playing with the baby I can have our entire dinner on the table in less than 20 minutes. The rice is what takes the longest to cook. Stay tuned, I’ll share the honey ginger green bean recipe on Friday. I made this for guests tonight and everyone raved about how delicious it was! It truly takes only moments to prepare, but tastes like something from a nice restaurant. I’m so glad to have found this recipe and I’m sure I’ll be making it many times in the future. Thank you for sharing it! Yvonne, I’m so glad you and your guest enjoyed this recipe! 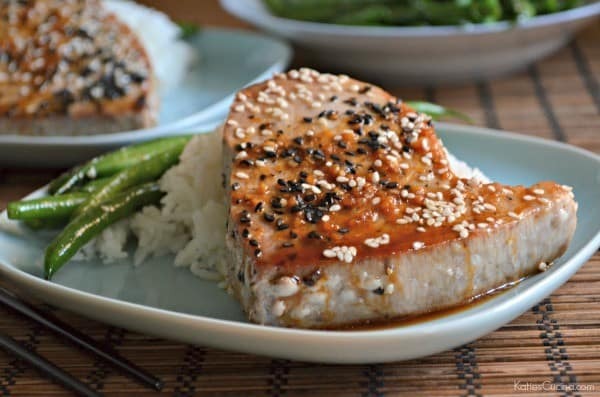 Yes–ahi tuna can be intimidating to make yet so easy!!! I made 2 tuna steaks with this recipe. Happy Cooking! This is a such a easy recipe. I recently made it with Salmon (it was lovely) as I did not have Tuna in the house. Hi Loriann, thank you for taking the time to leave a comment. I’m glad you enjoyed it! This was so easy and tasty. First time making tuna and it came out great. I had to put the remaining sauce over heat before serving to melt the sugar. I also think if you want to be healthier you can do half the amount of sesame oil, because the sauce is certainly oily, but not in a yucky way. I served this over spinach, chickpeas, and sprouts, and it was very healthy and delicious. Hi Anna, thank you for taking the time to leave a comment. I’m glad you enjoyed this recipe! Sounds like you made a delicious meal. I prepared this tonight and it was so delicious! I’m amazed that for my first try this was better than any Ahi I’ve ever had in a restaurant, We’re really impressed! Thanks for giving me the courage to try it on my own! Hi Janet, thank you so much for taking the time to leave feedback! I’m glad you enjoyed the recipe. Do you think this would taste ok with fresh minced ginger?